The authorities cite infighting among lions and viral, bacterial, protozoan infections and canine distemper as reasons behind the lion deaths in Gir. Almost an entire pride of 26 lions in Gujarat’s Gir National Park has been wiped out in less than a month, sparking concerns about the threats to the Asiatic Lion population in its only abode in the world and the need for a second home to the king of jungle in India. With a high density of the lion population in the park spread over 22,000 sq km, the state government has assured of increasing Gir’s landscape several times. But the question is when and also, whether that will be enough, but nobody seems to have answers to these. “It is a cause of concern and we have screened the entire park. The infection is limited to only 0.1 per cent of the park. 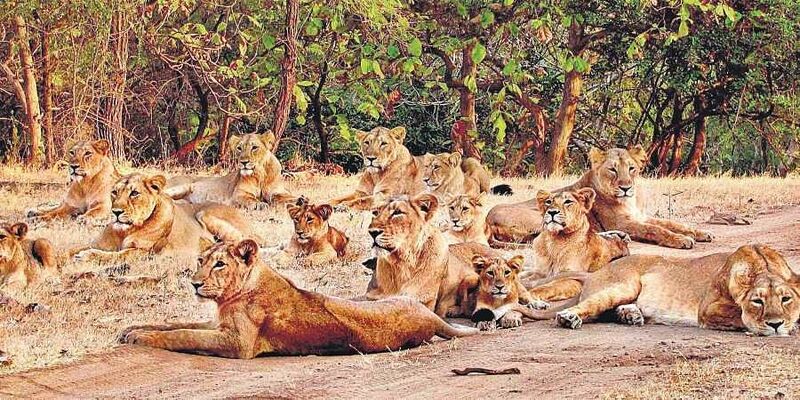 Various teams are camping in the park and animals are under observation to check any further spread (of the infection) to other lion prides,” said Chief Conservator of Forest of Junagadh wildlife circle, Dushyant Vasavada. The deaths have brought back focus on non-execution of the Supreme Court order of 2013 on translocation of the Gir lions to another habitat to protect them from possible extinction in case of an epidemic. The fear of extinction is seemingly backed by such incidents in the past when the entire lion population of the Serengeti National Park in Tanzania was wiped out in 1994 due to canine distemper virus. Even as the apex court has expressed concern over the recent lion deaths and has sought reply from the state and the Central governments, wildlife activists are contemplating approaching the court over the recent deaths and the urgent need for the translocation of lions. In the 2015 lion census, their number in Gir was pegged at 523. In 2017, as per an internal count, their population was estimated to be around 650. A significant number of the lions — nearly one-fourth — live outside the core habitat, increasing the risk to them from infrastructure projects, human-wildlife conflict and other external factors. Wildlife experts feel the actual number of lions living outside the core area could be even higher. The Gujarat government recently said around 184 lions had died during 2016 and 2017, of which 32 died due to unnatural causes, including poaching. The plan for translocation of lions from Gir to the Kuno-Palpur Wildlife Sanctuary in Madhya Pradesh dates back to 1993-94. But things have not moved in the last 25 years, mainly due to the Gujarat government’s reluctance to share the state’s pride. In 2006, the matter reached the Supreme Court following a lawsuit filed by wildlife ecologist Faiyaz Khusdar. The top court ordered Gujarat in April 2013 to give lions to Madhya Pradesh within next six months to save them from possible extinction in case any catastrophe like epidemic, large forest fire takes place and also to increase genetic pool. Ravi Chellam, a conservation biologist, questions the seriousness of the authorities. “The Supreme Court passed the order in April 2013 for translocation of lions within six months and it has been more than five years with very little progress on the ground progress, especially from Gujarat government. The authorities haven’t respected the spirit and intent of the court order. What justification do they have for this? A contempt petition was filed in SC in 2016. In the last hearing in March, the Government of India assured speedy action. The expert committee last met in December 2016 and since then, there has been little progress,” said Chellam, who is part of the expert committee formed to plan lion translocation. Warning against the spread of infection, Dr NVK Ashraf, chief of conservation at Wildlife Trust of India, said its looked like a contagious infection as there had never been so many deaths at Gir earlier. “It’s a wake-up call that an epidemic can spread anytime.... What is worrying is that the virus can attack the next pride,” said Ashraf. He also flagged the need to control the population of dog around the parks. “I’ve been told that dogs in the area are community dogs and not feral ones. Authorities need to check this,” he added. The lions must be saved by translocation of few to Barda or Kuno forest within 30 days.